Designed for high temperature applications, 310 stainless steel lap joint flanges provide high temperature oxidation resistance to 2000°F under mild cyclic conditions. An economic alternative to nickel alloys like alloy 330 or Inconel, 310 flanges provide slightly less strength and temperature resistance – but at a significantly lower price point. Alloy 310 can be used in moderately caburizing, moderately oxidizing, nitriding, cementing and thermal cycling applications when not used at the maximum service temperature. 310SS lap joint flanges also have good resistance to sulfidation and other forms of hot corrosion. Although primarily known for its high temperature properties, 310 stainless steel also provides excellent performance at cryogenic temperatures, with toughness down to -450˚F. Though 310 lap joint flanges are ideal for high temperature use, they should not be exposed to the severe thermal shock of repeated liquid quenching or where aqueous corrosive contaminants are present. Thermal processing and high temperature furnaces rely on 310 lap joint flanges for their high temperature and oxidation resistance in minor cyclic conditions. Cryogenic structures often use 310 stainless steel lap joint flanges for their strength at -450°F and low magnetic permeability. 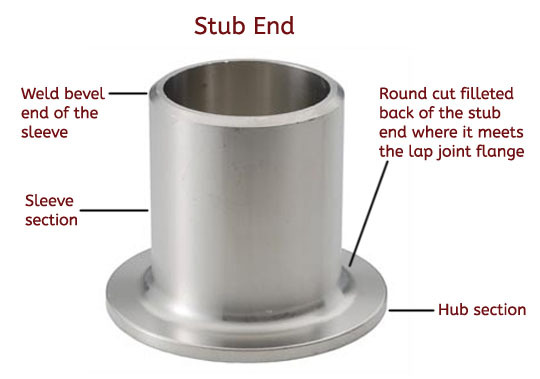 310 lap joint flanges are unique in that they are made of two pieces, the flange itself and the stub end. The front side has a flat face with a filleted (rounded) center hole to match the filleted back face of the stub end. Here the stub end will wrap tightly around the center hole of the flange. Shaped like a short piece of pipe with a weld bevel on one. This portion of the stub end is also called the sleeve. For high cost alloys the only "wetted" part is the stub end. 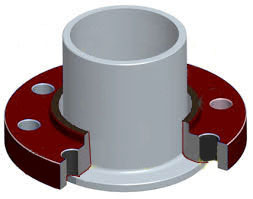 In this situation, it is only required for the stub-end to be made of the higher cost corrosion-resistant material, where the flange itself can be the produced from lower cost steel. 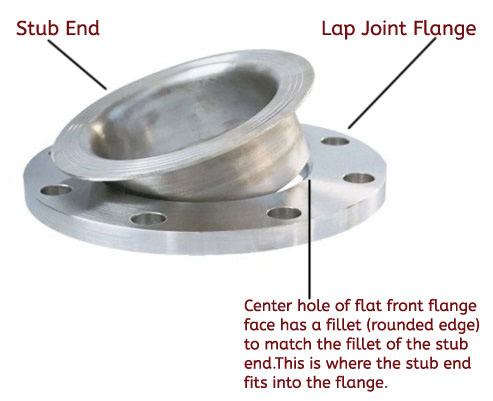 By using 310SS lap joint flanges, work can be simplified in situations that require frequent and rapid disassemble and assembly during the operation of a plant. The ability to spin that backing flange compensates for misalignment of the bolt holes during assembly.